What happens to rocket stages that land in the oceans, and how many are still there? When a rocket stage is jettisoned into the ocean, does it typically sink? Assuming yes, how many rocket stages are now lying on the ocean floor? Are there, on the ocean floor, areas where there exists a concentration of rocket parts associated with each launch site? Mostly, they sink. The Space Shuttle Solid Rocket Boosters were recovered (they were designed to stay afloat), Ariane 5 solid boosters were recovered on a few missions. The question How many rockets have been launched into space? (roughly, of course) gives a start to estimating the number of stages at the bottom of the ocean. But the number of splashed objects is different for each type of rocket. Russian and Chinese first stages usually don't end up in the ocean. The first stage for other launchers usually lands in the ocean. Many launchers use a variable number of boosters (1-5 for Atlas V, up to 9 for a Delta II), these would also splash down. So you'd have to check each launch for # of boosters. Sometimes the second stage is suborbital and splashes down, sometimes it goes to orbit and burns up on reentry. So a Fermi estimate: half of all launches end up in the sea (2500) with 0-10 boosters is 2500-25000 stages on the bottom of the oceans. as to 'how many are still there': all of them. Splashed stages are not recovered. Trivially, yes; for example, most launches from Florida have been to the east, you can imagine a triangle-shaped area extending out from Cape Canaveral into the ocean, defined by the allowable launch azimuths. Most of the boosters would land in this area. What happens to rocket stages that land in the oceans...? Most first stages aren't (relatively speaking) going that fast, so they don't burn up, but suffer mechanical damage when they crash into the ocean. 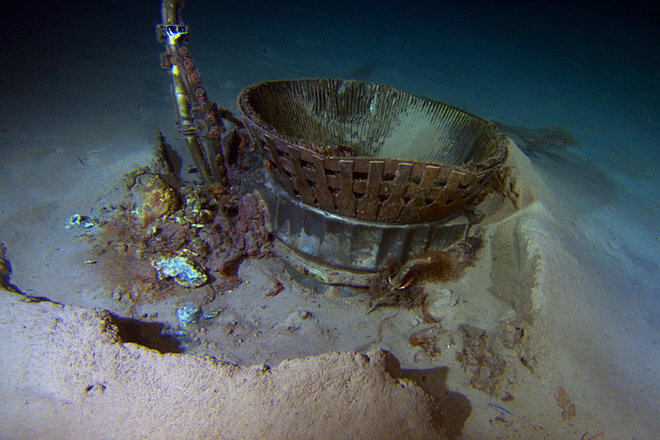 Here's a picture of remnants from a Saturn V first stage after many years in the ocean. Not the answer you're looking for? Browse other questions tagged launch rockets launch-site pollution or ask your own question. Are payload and impulse the sole criteria to decide the engine? What is the ideal shape for a rocket? How weak can a propellant be and still get a rocket to space, theoretically? What is the legal status of waste rocket parts ending up in the ocean? How could we make a fair comparison between space rockets regarding their payload mass in low Earth orbit and Earth escaping? What happens to the last stage of rockets?